The Devil Put Jerry Cantrell Here! 2013 is proving that the rock quartet are still valid and have way more to give! Independence Day should be celebrated like this every year. Download 2013 hosted Alice In Chains and gave them time to play nine songs. If there had been a building to shake, it would have. Fans young and old jumping up and down to classics such as Man In The Box, Them Bones and Rooster. Singer William DuVall, though not the bands original voice, makes the band sound as they should, raw and gritty. Not with a Layne Stayley type yarl (Stayley was the original singer and founder, 1967-2002) but with an in your face, I’ve got you by the balls, I own this and you, croon. Of course, there were more acts to be considered at Download and the crowd, appetite whetted, were played out with two of the bands biggest hits. Had the band been able to continue, the crowd would have been very spoiled, as was the case at Rexall Place, Edmonton, Alberta. July 4 2013. Less than three weeks after the huge English festival. Barely a spare seat in the house, Alice In Chains was preceded by late add, Monster Truck, who as always perform to a capacity crowd, even when most folk are still on the drive to the show. Young, energetic and playing like the world is about to end. Following Monster Truck are Chevelle who, for a three piece belt out some serious decibels. Not a choice that many would have put with the Seattle band, but providing noise aplenty to get the crowd hyped. Not until song three of the Alice In Chains set did some of the crowd get to their feet. Shameful really. Them Bones with it’s uniquely grinding guitars, made the older element in the crowd realize what it was they were doing there. This was BIG. Drummer Sean Kinney, smoking cigarettes throughout the set, making what he was doing look incredibly easy resisted the temptation to perform a solo. Kudos. This was about the band bringing a way overdue show to the music faithful of Edmonton. Bassist Mike Inez, replacement of original bassist Mike Starr (April 1966-2011 and with AIC form inception to 1993) happy to keep time, often slipping to the back of the stage. No ego here either. 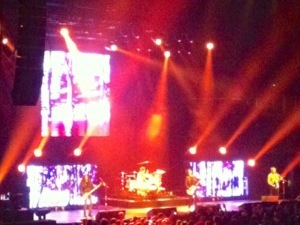 Jerry Cantrell, guitarist and founding band member made some hellishly difficult guitar look like a walk in the park. This guy doesn’t get nearly the recognition he deserves. There were tears from the eyes of some in attendance and they were earned and deserved. Cantrell delivered riff after riff and it was unbelievable to watch. Cantrell made sure to “remember brothers Layne and Mike” as part of his nightly ritual. Refreshing and very human. Again, William DuVall owned his position. He knows his place and the crowd was thankful for him. 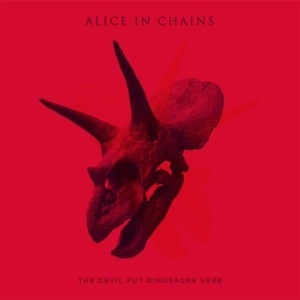 So a band from the 80’s that are still producing great music, Voices, from the new record premiered live at this show, to a great reception, Alice In Chains can still pull it off……and how. An inspiration for so many of todays younger musicians. Catch a live show by this band, this summer. You won’t be sorry you did. You will be sorry if you don’t! THE DEVIL PUT DINOSAURS HERE is available now on Capitol.